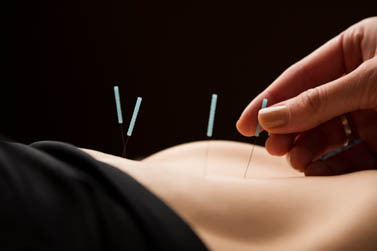 Acupuncture is effective for relieving slow transit constipation (STC). Slow transit refers to the slow passage of feces through the large intestine. Acupoint ST25, Tianshu, and CV12, Zhongwan. STC is a type of functional constipation that is present in approximately 15 to 30% of constipated individuals and is characterized by strained bowel movements with lumpy or hard stools. STC involves fewer than three bowel movements per week and is accompanied by a sensation of incomplete evacuation. There may be concomitant abdominal pain, nausea, and low appetite. The incidence of STC increases with age. In a meta-analysis, researchers document that acupuncture, electroacupuncture, and moxibustion are effective treatment modalities for STC. The single most frequently used acupuncture point for the treatment of STC across all of the studies demonstrating that acupuncture is effective is Tianshu (ST25, Heaven’s Pivot). This acupoint is located bilaterally on the abdomen, 2 cun lateral to the navel. According to Traditional Chinese Medicine (TCM) principles, this is the Front-Mu acupoint of the large intestine. Traditional functions for this acupoint include regulating the intestines, spleen, and stomach. In addition, ST25 resolves dampness, damp-heat, qi stagnation, and blood stasis. Given the traditional functions, it is no surprise to find ST25 is in common use for the resolution of STC. Traditional indications for the use of ST25 lend insight as to why many researchers investigated its efficacy for the treatment of STC. Indications include the treatment of diarrhea, constipation, undigested food, edema, dysuria, intestinal abscesses, abdominal pain, abdominal distention, and dysmenorrhea. The overall TCM principle garnered by the researchers was that ST25 dredges Qi in the large intestine to restore transit functionality. Previous PostPrevious Singapore zoo heals animals with Chinese Medicine.